Rotherham's miserable away form continued as Lucas Jutkiewicz's hat-trick fired Birmingham to a 3-1 win at St Andrew's. 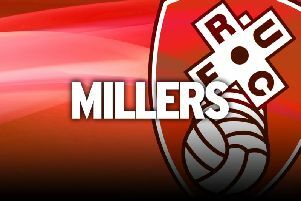 The Millers, who were running on empty amid an injury crisis and three games in a week, have now lost all six of their games on the road so far this season and it never looked like being anything other than a defeat in the second city. They did at least end a 437-minute away goal drought when Jon Taylor scored late on, but it is now 31 games since Rotherham won away in the Championship. Two goals in three first-half minutes ended this one as a contest as Jutkiewicz's good form continued. He was the beneficiary of a rare error from goalkeeper Marek Rodak in the 20th minute as the Slovakian failed to keep out a Jutkiewicz's header at the near post in what should have been a routine save. Rodak was shoddy again three minutes later when he fumbled Gary Gardner's shot and the former Everton striker bundled home the rebound. Rotherham tried to respond before the break but former goalkeeper Lee Camp tipped over a Ryan Manning effort and then Ryan Williams chose to pass when he should have shot. It was game over midway through the second half when Blues worked a clever free-kick to Jutkiewicz who hammered home his first career hat-trick. The Millers finally scored their first away goal since the opening day of the season when Taylor converted Kyle Vassell's cross but their away-day woes show no signs of ending.